I once had a blog called “Citizen of the World” that I lost since my former (read: lousy) web host decided to no longer support WordPress. With the exception of the Passion Cafe, which has since closed, and any deaths in my family, things really haven’t changed even after a month and two years. 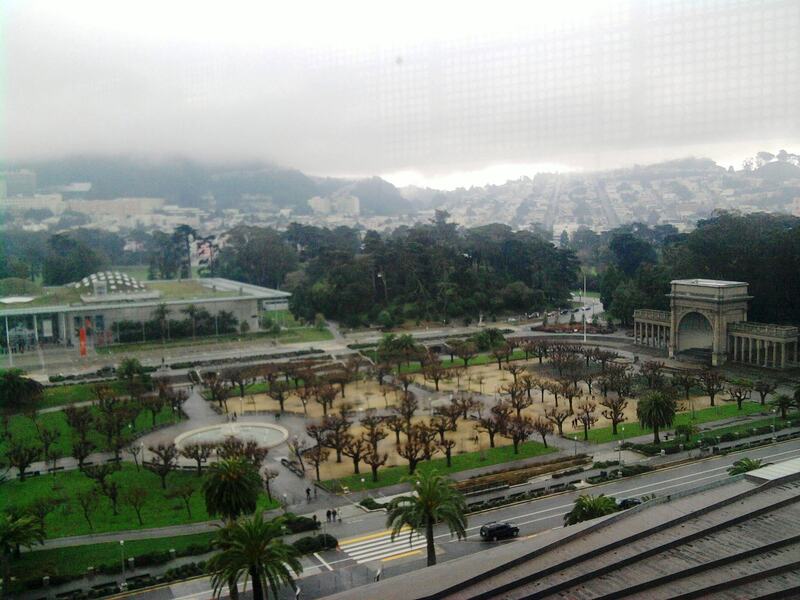 Golden Gate Park from the top floor of the DeYoung Museum on New Year’s Day 2011. The year unfolded with a European flair. My friend Wendy and I went to the DeYoung Museum on the first day of 2011 for the last half of the Orsay Museum traveling exhibit of Impressionist art. And then we had lunch at Marnee Thai in the Inner Sunset. In February, I met someone out of the blue, and it is a topic of discussion at lunch with my friend Rose at Rocco’s Cafe. After saying good-bye to a close family relative in the hospital in March, supper at the cacophonous restaurant, So, was quite frankly the right antidote for the insular sadness of the ICU. Her death was one of things Rose and I spoke about on our recent lunch this month on the rooftop of the Passion Cafe, a perfect choice for the welcome warm weather in San Francisco. My curry chicken salad paired nicely with the organic Pinot Gris. Later we stopped by Split Pea Seduction for its chocolate chip coconut oatmeal cookies. I know life is often beyond my control. But if I am open, there is a moment of clarity when I see a well of endless possibilities. Life never stops. Like the universe, it just keeps expanding.